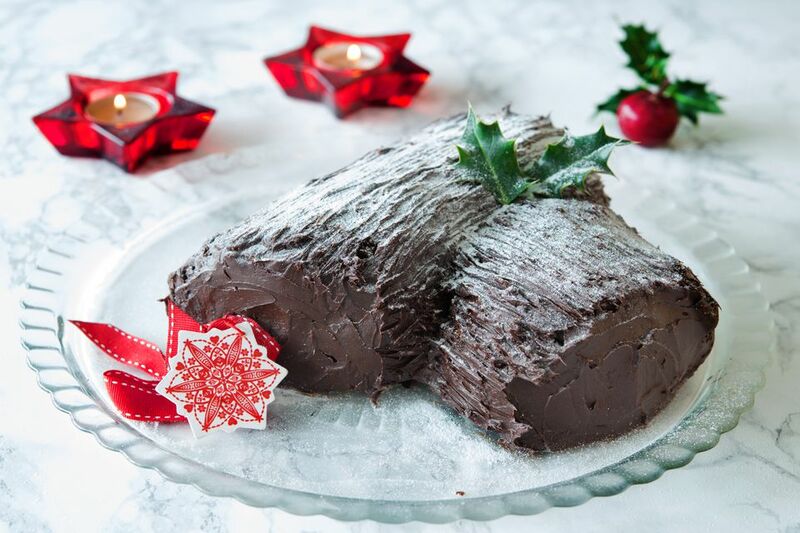 For a showstopping cake on your Christmas table, you can't go wrong with a lovely Chocolate and Cream Yule Log. This stunning cake is much easier to make than you may think with these step-by-step instructions. Start with the log itself, which is a chocolate Swiss Roll that's unrolled, but still, on the parchment paper, it was baked on. Using a long palette knife, evenly spread a layer of chocolate ganache on top of the cake, making sure you spread it out to all four edges. Having whipped your cream to soft peaks, use a large metal spoon to spread a thick, even layer on top of the ganache. Do this gently so as not to disturb the chocolate cream or tear the cake. Again, make sure you reach the edges. Once the chocolate and the whipped cream are on the cake, re-roll the cake as tightly as you can without squeezing out the creams. Using a sharp knife, cut away the two ends of the cake to both neaten it and to reveal the soft sponge and the rolls of cream. Cut the cake at an angle into one-third and two-thirds each. Place the smaller piece at an angle to the larger to create a branch effect. Using a piping bag filled with chocolate ganache and working quickly—the ganache will melt if left in the warmth for too long—pipe a thick, generous layer of the chocolate over the cake in long, sweeping lines. Don't forget to cover the ends too with a couple of swirls of cream. If you're not comfortable with a piping bag, use a palette knife to spread the ganache. Using a fork, gently fluff up the ganache to create a bark-like effect. 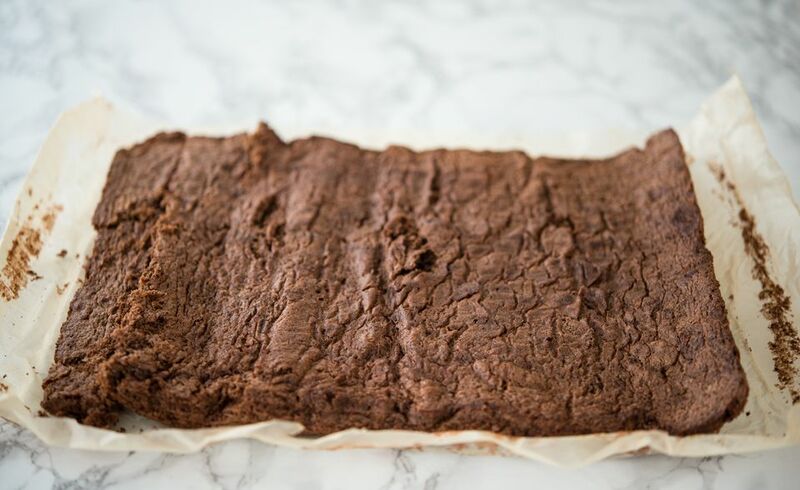 By now, your cake will be starting to look like a 'proper' chocolate log. If the chocolate has become too soft, then pop the cake into the fridge for 10 minutes to harden it up again. Now it's time to add the finishing touches to your log. Snow is one of the easiest effects to add. Place icing sugar into a fine sifter or use a sieve and shake gently over the cake, moving from side to side to prevent the icing sugar from clumping. Finish the decorating as you wish with leaves, berries, a Santa or other tiny figures—how you finish it is up to you. The cake should be eaten within 24 hours and keep stored in an airtight tin in the fridge.